Last night I attended the Christmas concert of the Longmont Chorale, the community choir where my Hot Mom sings and sits on the Board. This year, the Longs Peak Flute Ensemble performed with them. 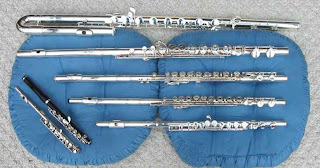 I'd never heard a flute ensemble before, and I have to say that while I'm not a huge fan of the piccolo or the soprano flute, I've decided the bass flute is the coolest instrument ever. Each year, the chorale purchases a bunch of poinsettias to decorate the church where they have their Christmas concert. After the show, chorale members can buy the plants for $10.00 and take them home. My Hot Mom bought one for herself and one for my Hot Gram this year. Because she's going to be staying here at the Yellow House the week of Christmas in order to watch her Granddog while we're out of town, she asked me to take her plant home with me. I've decided to name the thing "Audrey." I hope I don't kill it before Friday, when my Hot Mom is scheduled to arrive. All the plants in this house are silk, and there's a reason for that. I have no skilz with live plants. I kill cacti. Normally I wouldn't try this at home, but I'm going to do my best. Hot Mom is watching the Incomparable Boogie™ so he won't have to go to a kennel, and the least I can do is to try and keep her man-eating poinsettia alive. Wish me luck. IN a week, you should be okay. Keep it away from doors, because cold drafts do not may Pointsettia happy. Don't put it in the dryest room in the house. Plants like humidity. Make sure it gets 10 to 12 hours of light. Michelle, I appreciate the tips. I think I can manage everything except the humidity thing. Wintertime in Colorado means about 2% humidity. Or less. Maybe set it in the near the bathroom where you shower, or near a sink. But really, for a week it should be fine. I had two poinsettias that managed not just to survive the summer, but to thrive. Brought 'em inside, put 'em in the basement, and they're dead. Too cold. Heh, Anne will back me up if she wasn't too young to remember it, but the most notorious biker bar (one where they busted the some of the staff for selling coke) in the town we went to high school in was called the Yellow House. Anne - it was the place on Alternate 40 going towards Funkstown, past Terry's Auto and the VFW, right by the Boonsboro trailer court, on the right hand side if you were going away from Boonsboro. John, if such a thing occurs, the story will be broken here on HCDSM before the Denver Post. I have three poinsettias at my house right now - and a total brown thumb, so their days are numbered. The street lights never turn off some days here, it's so gloomy. And while my house is wonderfully set up for summer, stays cool and shady among the trees with its covered porch and deck - but that means it's downright *dark* inside in winter, I have to have lights on during the day. I'm sure you can keep the man-eating plant happy until Boogie's Grandmother arrives. It's only a week, right? Have you named it? If not, can I suggest "Audrey"? Once a poinsettia is in bloom, you're looking at maintaining, which is far easier than getting it to bloom in the first place. 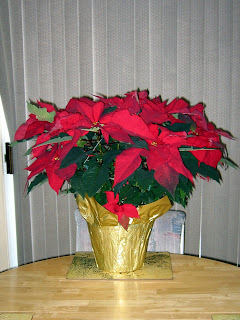 Poinsettias, like most other plants, need regular watering, but they should not *sit* in water. So it's best to thoroughly water them, make sure all the excess water drains out, and then do NOT water them again until the soil is dry to the touch. This means they only need watered once or twice a week. The humidity is a problem because very dry air temperatures will pull the moisture right out of the leaves, so you can get dry dessicated looking plants even if the soil is moist. Misting with a spray bottle can help if the humidity is extremely low. Sorry, phytochrome controls light dependent flowering. Gibberellins control stem elongation, which is often light dependent, hence my confusion.